Anti-IDF group accused of working with Arab cameraman who had a history of throwing rocks himself. A young Arab who worked as a volunteer with B'tselem, a far-left group which claims to be a "human rights" organization, participated in a violent riot and tried to use his B'tselem equipment to persuade soldiers that he was just a cameraman, a report on the website Mida reveals. According to the report, the incident occurred southwest of Hevron, on June 7 of this year. 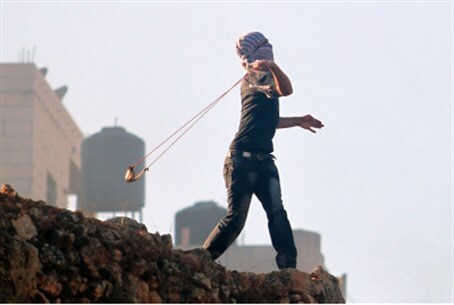 Ten or 15 Arab youths gathered and began throwing rocks at two IDF soldiers – First Sergeant Eldad Kedar and First Sergeant Avihu Abu – who were inside an abandoned house, from a distance of about 100 feet. One of the Arab youths, in particular, drew the soldiers' attention, because he was wearing a pink shirt and a backpack. After about an hour in which the Arabs threw rocks, a “chase unit” began pursuing the rock-throwers. Sgt. Abu, who was functioning as the lookout, noticed the youth with the pink shirt running to the left, then putting on a safety vest and taking out a B'tselem camera. The Arab youth told the soldier when he was arrested that he was just a cameraman for B'tselem and had nothing to do with the rock throwing. He was found guilty in the second case as well and sentenced to 6.5 months' imprisonment, 10 months' suspended sentence and a 2,000 shekel fine. Mida says that B'tselem's “Armed with Cameras” project employs hundreds of volunteers who try to record the IDF behaving improperly, but does not carry out a background check to make sure they do not have criminal records. The website notes that it is clear that when a person who is an ideological enemy of Israel is used to document events, he cannot be expected to worry about the accuracy and fairness of the documentation. “This situation is even more serious when the person in question has already thrown rocks at IDF soldiers and is sent by B'tselem to 'document' similar situations, in which it is reasonable to assume that he will return to his bad ways,” the website adds, leveling blame on the radical New Israel Fund as well, which it says gave B'tselem $250,000 last year alone. B'tselem's reaction to the report claimed, among other things, that volunteers for the “Armed with Cameras” project sign an agreement and take part in workshops that make clear that if they break the law, act violently or throw rocks, their participation in the project will be terminated and they will not receive legal aid. B'tselem said that the youth will not take part in any activity on B'tselem's part in the future.